If you read the “articles” I posted back in January about the music I listened to the most in 2012, you may recall that last year I got myself really into a band called Tonight Alive. What Are You So Scared Of? was -by a very wide margin- my most listened-to and favourite album of the year, and I still spin it (figuratively, I’ve only used the disc to rip the songs to my PC and 360) fairly often. I’d absolutely consider the Australian band to be one of my recent favourites. Over the last few months, I’ve been absolutely frothing with demand for their second album, The Other Side. It finally dropped on September 10th, and I couldn’t have asked for a better belated birthday present. I was on vacation last week, and it’s the only music I bothered to listen to the entire time (radio during car times notwithstanding). Seriously, I listened to that thing like six times last Friday. It’s been a long, long time since I’ve gotten myself so worked up about an album. A new album anyway. I listened the crap out of Queen’s The Miracle when my years-long search for a copy came to a close last year. 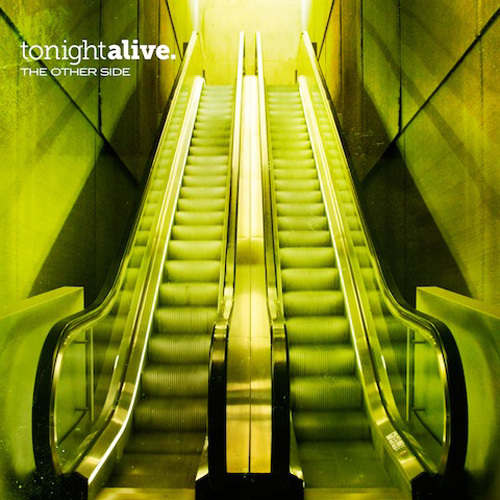 The Other Side is basically exactly what I love to hear in a new album: It’s got all the elements of Tonight Alive that made me fall in love with them, but it really doesn’t sound much like their previous works. For the most part, What Are You So Scared Of? was much more youthful and energetic, where The Other Side shows a lot more deliberation and seriousness. That’s not to say that it’s like one of those boring, stuffy indie albums. Not at all. There’s still plenty of life in this album, and at the same time it is certainly deeper than its predecessor. Jenna McDougall’s vocals in particular are what attracted me to the band in the first place, and she does not disappoint at all. I thought she was a pretty great singer before, but she has gotten even better over the last year. Her voice is immediately familiar, but also shows a little more maturity in her style, spending more time in a slightly deeper range than I’m used to hearing from her. Hell, she uses a whole lot more range in general. Though she still throws in a few super-girly squeaks in here and there, which delights me wild ways. It’s hardly the evolution in vocal style that Hayley Williams showed between Riot! and Brand New Eyes, but you can definitely hear Jenna refining her talent. I’ll admit that I feel a little bad making a comparison to Paramore there, because I’ve seen far too many people just write off Tonight Alive as an Australian equivalent or copy of Paramore, but that’s so far from the truth. In fact, taken as a whole, The Other Side doesn’t immediately remind me of any other bands or albums at all. The tone and pacing of the first verse of “Come Home” inexplicably gives me a bit of a vague Taylor Swift vibe (“State of Grace” maybe? I can’t really place it), but shakes it off as soon as the chorus comes around, and I find the overall sound of the album to be very distinct. At the very least, it sounds like nothing else that I’ve ever listened to. If you need a sample of what you’re getting from The Other Side, I’ll embed the video for the second single from the album, “Lonely Girl,” which may not be the best track on the album, but is probably the catchiest. At least it’s the one I’ve been singing to myself all week. I’d be hard-pressed to choose a favourite song at this point. I’ll need a few more weeks and a few dozen more listens to really let this one digest. The current standouts, though, are “Lonely Girl,” “Hell And Back,” “Complexes,” and “You Don’t Owe Me Anything,” which are all pretty unique and bring totally different qualities to the table. I don’t know why I’d want to choose a favourite song anyway. It’d be a total waste to go to a buffet and just load your plate up with one kind of food. I don’t really have a good paragraph to fit this note into, so it’s its own thing: the track “No Different” contains a very piratey-sounding guitar riff and chorus. I don’t know how to explain it, but it just makes me think of pirates. I’m chalking that up as a Pro. This is all sort of a roundabout way of saying that The Other Side not ony met, but exceeded my expectations to some unmeasurable degree. Over the last year What Are You So Scared Of? and the Tonight Alive EPs (All Shapes And Disguises and Consider This) have laid siege to my Last.fm charts, and The Other Side is absolutely the secret weapon that’s going to propel them straight to the top. I know I don’t really keep up with music the way I used to, but there is no way I’d even consider another candidate for my 2013 album of the year. Not even Go Radio’s Close The Distance, and I am pretty darn crazy for Close The Distance. Well, I suppose we’ll have to see if Kris Roe ever actually releases The Graveyard of the Atlantic, but I doubt that even The Ataris could manage to overcome my absolute adoration for all things Tonight Alive.